halfgiz wrote: How much would it take to get Slotter up to speed? Nobody knows because he has been a well kept secret. He got Wentz and Carr ready in short order. I would imagine John could also tweek Keenum slightly. My thoughts are you might be able to also get a healthy year out of Bradford now that his knee is cleaned up. I'm sure it will all get figured out who will be the best fit in the next 3 weeks. If not by then we will probably go FA. Then we just have to figure out who they are after. Very excited about this hire. Definite possibility DeFilippo will be an upgrade over Shurmur. I wonder if the Vikes have any thought that they may groom him to take over the HC job in 2-3 seasons. Seems like he has the smarts, passion, and drive to make him a potentially great one. On offense you have an aged player in Berger at RG. That's it. Rudolph is probably "middle aged" in NFL terms. Reiff was drafted the same year as Kalil, so there is still some shelf life there, plus he plays Tackle, not RB so could go for awhile yet. On Defense, Griffen and Smith are the big names that are probably going to start running into the wall of age. That being said, I'd the team has at least two and probably three seasons where this defense will continue to be elite. My opinion is that if they can add a strong player at QB they have the making of a team that can win for at least the next 2-3 seasons and probably longer depending on how the drafts go. For this reason I think getting Cousins would be a huge win. IMO, the biggest hurdle next year is an absolutely brutal schedule. It seems very unlikely that they'll be able to string together 12+ wins in the face of their road schedule, therefore in the post season they are probably not going get a bye week and will likely to win at least one playoff game on the road. They are capable of doing that, but they need to get over laying eggs 2-3x a season. If you've been following the team awhile, you know that this issue has blagged the Zimmer era. Really happy about us picking up DeFilippo - Really anxious to see what he can bring to the table with our QBs, also wanting to see what direction we go in, I know Rick was just saying a while back that the new OC would have significant input on where we go at the position, and I'm just wondering what that'll mean. Maybe he sees a guy in the draft who he absolutely has to have and Rick's gonna pull off a trade, maybe it's Cousins, I don't know but it opens up a lot of new things to happen. Also, awesome that we didn't allow the Giants to take Stefanski from us, and could potentially end up being our OC if DeFilippo is only here for one season. It's a brutal schedule based on last year teams. You never know what the next year will bring. It could turn out to be easy. After all, how many people looked at the Rams and Eagles on their schedule last year and said, "It looks like an easy schedule." Slick Rick wrote: Really happy about us picking up DeFilippo - Really anxious to see what he can bring to the table with our QBs, also wanting to see what direction we go in, I know Rick was just saying a while back that the new OC would have significant input on where we go at the position, and I'm just wondering what that'll mean. Maybe he sees a guy in the draft who he absolutely has to have and Rick's gonna pull off a trade, maybe it's Cousins, I don't know but it opens up a lot of new things to happen. Also, awesome that we didn't allow the Giants to take Stefanski from us, and could potentially end up being our OC if DeFilippo is only here for one season. That's a great point. In fact, it's entirely possible that staying with the Vikings is actually better for Stefanski. Shurmur has made it clear that he's going to call the plays in New York, so Stefanski would be the dreaded "in name only" OC. It's true, but I'd say that a lot of these teams are probably going to be fairly good, and while one or two of them might fall off there's bound to be a team or two that you face that's better than you were expecting. I could see the Chicago Bears being decent next year - Trubisky has a year under his belt and I think the Bears will do everything in their power to get him protected and to put some more firepower into that offense while their defense looked fairly good last year despite finishing more towards the middle of the pack. Also, the Packers will have Rodgers back, and that should make them a much more difficult team to beat and despite the fact that I think we still win both games against them with Rodgers, he's probably worth a couple of wins over almost anybody who replaces him, and they'll have an offseason to arm up as well so I'd expect them to be better. We'll have a difficult schedule, but it won't be impossible. 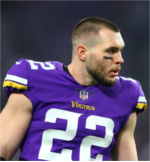 I've said it before, but I think the Vikings have more opportunity than any team right now to go into the season as the most complete team in the NFL - with all of the money that we have at our disposal, with the talent that we have already locked down on the roster, I have no doubt that we can win these games and match our 13-3 record. We might not beat that record, but I think we can match it and still be a better team than we were last year. Also, a little side note - I really want to see us beat the Patriots with Belichick and Brady on the roster. I've never seen us beat the Pats in my life, and this has to be the best opportunity we're going to get to do it but we'll be facing them in NE. I would like to put this out there, maybe Zimmer is pissed that the Eagles did so well against his defense and the only way he could find out how they did it was by hiring a creditable member of their staff to see how they did it. Not only will help him to make our defense that much better but to help the play calling against a good defense. Not to mention, he was part of the staff to know how to beat the Patriots. In my opinion this was a hire that means more than just being our Offensive coordinator. tstange wrote: I would like to put this out there, maybe Zimmer is pissed that the Eagles did so well against his defense and the only way he could find out how they did it was by hiring a creditable member of their staff to see how they did it. Not only will help him to make our defense that much better but to help the play calling against a good defense. Not to mention, he was part of the staff to know how to beat the Patriots. In my opinion this was a hire that means more than just being our Offensive coordinator. Or maybe John DeFilippo is simply the best offensive coordinator candidate out there. Which he is. The only question I have is whether he'll still be with the Vikings in 2019, or whether he'll be somebody's new head coach. #Vikings are expected to hire former #Raiders OC Todd Downing as a senior offensive assistant/passing game specialist, sources said. That's quite the title...where does that leave Stefanski? Sounds like we're stacking the QB solutions brain trust/think tank and potentially preparing for DeFilipo's exit as someone's hc next year. I might be reading too far into that last thought. I like what Spielman is doing. Get all the best opinions on QB's in one room and lets figure this thing out. S197 wrote: Glad it isn't Bevell!! Agreed, I mean I knew the organization couldn't be that stupid but it was still a scary thought. PhillyVike wrote: Sounds like we're stacking the QB solutions brain trust/think tank and potentially preparing for DeFilipo's exit as someone's hc next year. I might be reading too far into that last thought. I like what Spielman is doing. Get all the best opinions on QB's in one room and lets figure this thing out. If we advance far into the postseason and our offense looks on-time and in-tune all year, I would almost say it's a virtual certainty that he's hired as someone else's HC for the 2019-20 season. If that's the case, I think Stefanski or Downing could step up to fill that role. Obviously since he's been around longer and knows the offense more, Stefanski is probably going to be the one who's promoted. Still, he could join Shurmur in New York next year, and it's good that we're preparing by adding all of these established coaches to our staff this year. Doesnt it seem like since the Wilfes took over, that we are losing so many good coaches to other teams? I know its hard for then to pass up on a chance to be HC, but maybe the Wilfes could offer a little more incentive to stay around a few years here. It sure get annoying after liking the coaches and seeing things improve, just to start over again. Notice no one took Norv right away. That guy was a mistake from the start. Wish the Bear, Packers or Lions liked him a lot.